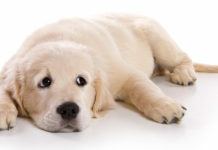 Labrador ear infections are relatively common. In this article we will lift the lid on some causes of dog ear problems. Looking at the signs, symptoms, causes, treatments and more. 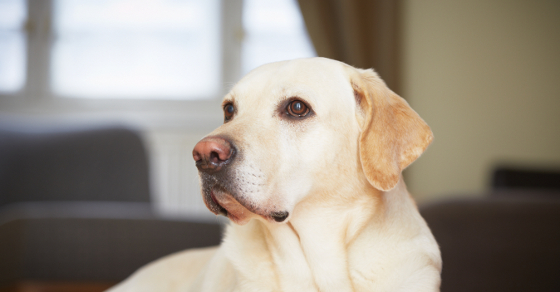 If your Lab is shaking his head or flapping his ears, he may have an ear infection. 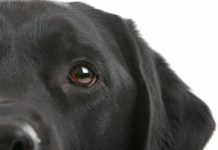 In this article we’ll be looking at why your dog may be getting ear infections, what kind of ear problems are common in Labrador Retrievers, and what you can do to help your dog. Why do Labradors get ear infections? Labrador Retriever ear infections and other ear problems are quite common. Labrador ears don’t have the best design when it comes to health. Nature designed dogs with pricked up ears for a good reason. Upright ears allow good air flow which helps to keep ears free from infection. Floppy ears have flaps which cover the ear canal, creating a warmer, darker environment where germs and other unwanted visitors can grow and flourish. What this means is that Labradors, and other floppy eared dogs, are somewhat more prone to ear problems, than dogs with pricked up ears. 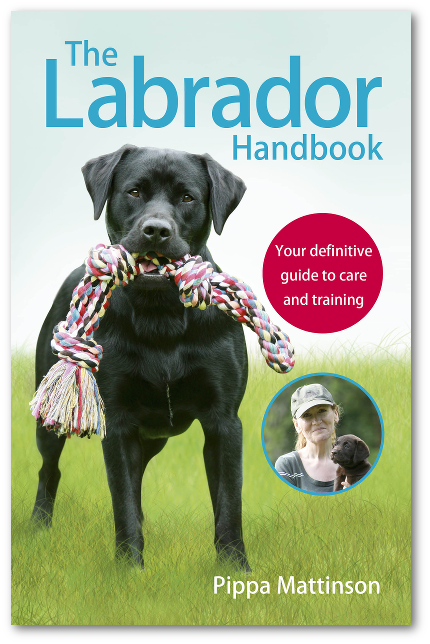 Individual Labradors with narrow or very hairy ear canals may also be at particular disadvantage. And Labradors in general are prone to a number of allergies which are known to be associated with ear problems. That doesn’t mean your Lab will be affected of course. 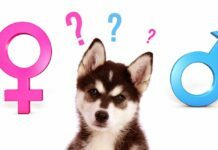 So how do you know when your dog’s ears are causing him a problem? Let’s take a look. Ear problems can be highly irritating, so you may see behaviors like head shaking and ear flapping. Or the dog may simply keep tilting his head to one side. Your dog may scratch at his ears with his hind feet. Or he may drop his head down and rub his ears with his front foot. He may even put his head on the ground and rub his ear along the floor. But, sometimes, ear problems can go undetected. This is why it is a good idea to inspect your dog’s ears from time to time. A grubby or sore appearance with a lot of dark brown wax coming from the ear canal, is not a good sign. Nor is any kind of odor. Your dog’s ears should not smell at all. The pain and irritation that causes your dog to rub or scratch himself repeatedly is the result of an inflamed ear canal. One of these three types of creature is usually the culprit. And it isn’t always obvious which one you are facing to begin with. Otitis Externa is closely associated with atopic dermatitis and other allergies. Over 55% of dogs with atopic dermatitis also suffer from ear infections. And over 80% of dogs with food allergies are sufferers too. If your Labrador has been shaking his head vigorously and repeatedly, ears flapping wildly, he may be troubled with ear mites. These irritating parasites are a relatively common labrador health problem. Ear mites are minute creatures that look a bit like tiny white crabs. They are just visible to the naked eye and your vet may be able to see them, when he looks in your dog’s ear. He’ll certainly be able to see them under a microscope. They live in the ear canal of affected animals feeding off the debris there (dead skin cells etc), and sometimes causing intense irritation. Has my Labrador got ear mites? 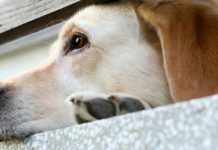 Dogs are affected differently by these creatures with some Labradors scratching their ears until they bleed whilst others barely seem to notice them. Your dog’s ear canals are likely to look dirty and possibly to smell unpleasant if he has mites. Your vet will be able to confirm the diagnosis, and if you have more than one dog, or a cat, you will need to treat them all because the problem is easily spread from one dog to another. Treatment takes a few weeks to eradicate the problem completely so you will need to be persistent. Your vet will give you a localised treatment to apply to the ear itself, and you will find it helpful to also treat the dog generally with a flea/tick product. 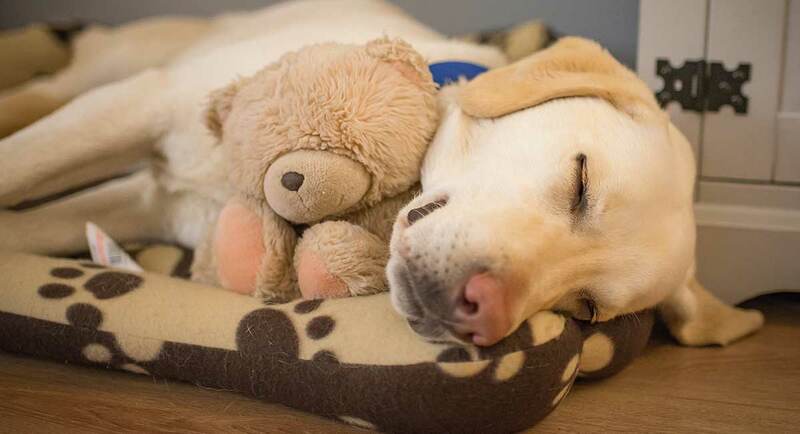 Treat your dog’s bedding too for an effective cure. Remember to keep cats away from dog flea products, they can make cats very ill. You will need a cat specific product to treat your cat. 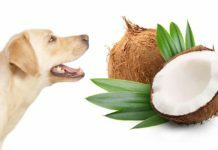 A yeast or fungal infection is another common problem in dogs, especially those with floppy low hanging ears like Labradors. Yeast infections are one of the problems that may also be more common in dogs with allergies. A study published in 2002 showed that dogs with an allergy to mould, trees, or cultivated plants were more likely to suffer from skin and ear yeast infection. A yeast infection can cause the ear to smell unpleasant, as can a bacterial infection. What do I do if my dog has an ear infection? The first step is to get a diagnosis. 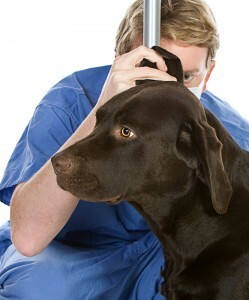 Your vet will be able to look inside your dog’s ear with an otoscope. He can also send off samples of the material inside your dog’s ear to confirm exactly what is lurking in there. He may want you to clean your dogs ears each day for a while to help improve the environment inside them. If your vet thinks that there is a bacterial infection he may prescribe antibiotic drops to be placed into the ears. A yeast infection can be treated with anti fungal drops. Do dogs ear infections get better on their own? It can be tempting to leave what seems to be a relatively minor problem, and to wait and see if it clears up on its own. With ear infections this is a bad idea, for three main reasons. Firstly because they are distressing for the dog. And secondly because the dog that is flapping his ears to relieve the irritation inside them, is quite likely to give himself a haematoma of the ear flap. This is where bleeding occurs inside the flap from the constant shaking, and a big cyst fills with blood and if left may eventually burst. Treating the haematoma, stitching, draining etc, can be a lot more trouble, and a lot more expensive, than treating the original ear infection. How do you prevent ear problems in dogs? A good circulation of air helps to keep ears healthy. 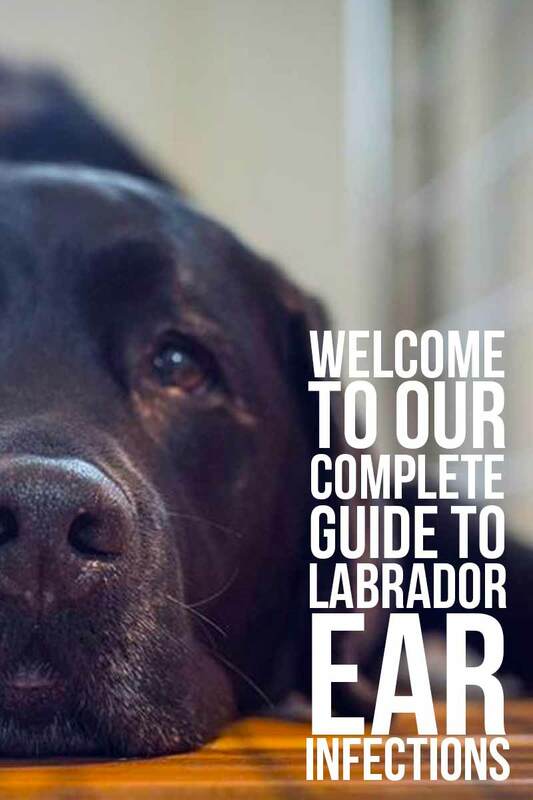 Upright ears have the advantage, but you can help your labrador by keeping his ears clean and free from debris so that the environment inside them does not encourage and overgrowth of unpleasant visitors. If your dog has a lot of hair growing in around the entrance to the ear canal, your vet may recommend you trim it. And if you take your dog for a check up and he thinks your dogs ears look a bit grubby he’ll ask you to clean them. It may be tempting to dunk your dog in a medicated shampoo to try and fend off more problems, but washing a dog more frequently may not help. Not only do you risk pushing water into the ear canal, but allergies in Labradors may be more common in dogs that are washed regularly. Always check with your vet before investing in medicated shampoos in any case, as not all are suitable for all skin/ear conditions. How do you clean a Labrador’s ears? A large ball of cotton wool moistened with warm boiled water or a little of the ear cleaner recommended by your vet can be gently wiped around the opening of the ear canal, as far as you can easily see. Don’t be tempted to poke anything down into the ear canal itself, this just pushes wax etc back inside and may make it more difficult for the dog’s ears to clean themselves naturally. What should I do if I suspect my dog has an ear problem? Your first port of call is a trip to the vet. It’s tempting to try and treat the problem yourself, but the main problem is diagnosing what is wrong, and your vet has the equipment, knowledge and facilities to do this. You don’t want to end up with an operation on your dog’s ear. So it’s best to get the vet involved sooner rather than later. 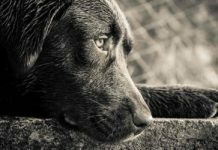 Next articleDo Labradors Need Friends: Should I Get A Second Dog? Can ear candles work for dogs? It definitely draws all the wax and yuck out of human ears. Hi I’m Lindsey I have a 8 year old lab. His hair is starting to fall out and he’s got bald spots also he’s losing his hair is is that nateral? I mean he is a old man lol. Put lab was constantly scratching his ears and getting infections. We switched his food to Taste of the Wild and he hasn’t had an ear issue of any sort since 2013.
which flavor? We use a grain free food, and tried some without beef (thinking that is the cause) but she is still getting a lot of fluid coming out of her ears. My 5 month old puppy has one red ear I cleaned it with a special ear wipe cloth with witch hasel last night and this morning it’s got brown shoe polish like discharge and tiny little red scratch marks and seems worse . I read that it could be mites. Any suggestions? My 10 month old yellow had the same symptoms. My vet diagnosed it as a yeast infection. We are treating it with a prescription of Zymox Otic w/ HC 1% for 14 days and then we go back for a recheck. My lab also had this and ointment after ointments the finally decided to perform ear resection surgeries on both ears and have never had the problem since. My black lab Buddy has an ear problem he shakes his head all the time had him to the vet don’t know how many times but his right ear get black wax and I clean it but it stays red the vet sold me some stuff in a tub called Otibiotic Ointment to use when needed is there anything else I can do..